The Dragon’s Breath books are listed below in the order they should be read. Four months ago, fire-breathing dragons invaded Earth from an alternate dimension, wreaking havoc on modern civilization. Bailey Monzac has been training to kill them ever since discovering she was impervious to their flames, but when some of the beasts begin targeting children, she can’t hold back any longer and must hunt them down. Her ally, Aidan, would help, except the shape-shifter has his own troubles. His clan is battling for territory against the pure dragons and his father—their leader—is dying. As the shifters fight for the pendragon position, fierce rivalry takes over. Aidan’s own brothers aren’t above blackmail and murder if it will get them to the top. He must stay one step ahead if he is to survive and keep his clan safe from the pure dragons who threaten them all. Bailey and Aidan may be natural-born enemies, but working together might be the only thing that saves them from the danger that lies ahead. Great vacation book. Wish the second one was as ready as I am. Thanks, Rob. I’ll get it out as soon as I can! what a great book! Love that your books are so original. I’m a huge fan of the sensor series and wish I could say ‘”ust focus on Melena and keep those books coming!”, but now I have Bailey and Aidan and I simply must know more of their story. So I’ll just say “please, stay healthy and happy and write as much as you can, about whatever you want, LOL! I’m sure I will love every word”. Ahh, thanks, Isabel. I’m glad you’re enjoying both series! Read all the sensor books in a week, just finished the first Dragons Breath, enjoyed them all immensely, cant wait for the next book in either series, a refreshing change of pace, loved them all! You read fast, Joanne. Thanks so much for following both series and glad you are enjoying them! please stay healthy and be happy. I just love both these series and can’t wait for the next books to be released!! Keep up the great writing. Such a great book! I couldn’t put it down. Can’t wait til the new book is out. Glad to hear it, Daryl! I have read “stalked by flames” several times and can hardly wait for the second book to be released, depretly waiting to see what happens and if love prevails. I read a ton of U/F but there are only a handful which I can say i’m really excited about and Stalked by Flames definetly falls into that catergory. I can’t wait to read the next book! I Really liked this book and am looking forward to the next one coming out. I haven’t seen any info on when that may be however. Can you please give us a hint. Personally given a choice between a new book in your Sensor series and the Dragon’s Breath series I chose a new Dragon’s Breath book. Your Sensor series is good and I have read all of the books but I think the Dragon’s Breath series is better. Sorry I’m just getting back to you, Adam. The next Dragon’s Breath series novel will be out on June 24th. Glad you enjoyed the first book. Read the Sensor series, and liked the uniqueness of the plot. Just read book one of the Dragons Breathep series. I may like it more. Can barely wait for book two. On a more personal note, my condolences to you and your family. He sounds like he was a wonderful man who inspired you postively. I’m sure he’s still looking on with pride. Thank you, Glenda. I appreciate your condolences and kind words. I LOVE how the Stalked by flames book is written. I couldn’t put the book down at all. I cant wait for the next book! Really looking forward to reading it and falling in Love all over again. Just finished book one of the Dragon’s Breath series. Really enjoyed it and can’t wait till next month to read the next one. I’m going to check out the Sensor series. Really hope I’ll enjoy this series as much as Dragon’s Breath. I’m glad to hear you enjoyed the first Dragon’s Breath book, Roni. Book 2 will be out in less than a month! Have just enjoyed reading your first two Sensor books and fancy trying the Dragon’s Breath books, however could only find them on Amazon. Is Stalked by Flames available in EPUB format anywhere? I have thoroughly enjoyed my first taste of your writing, the Dragon’s Breath series. I just finished book 3 early this morning here in Sydney Australia. To give you an idea of how wide ranging your readership is I am 61 years old and despite the genre categorisation I am enthralled with Bailey and her experiences. I must say, I do not have the writing skills of one such as you… yet! I am a storyteller. I have a heart and soul that wants to inspire young children and young adults to broaden their imaginations, to embrace their ability to fantasize and dream, and put those dreams to practical use. Stories like the one you have crafted here provides so much material to do so much with for our ‘little ones’. I look forward so much to books 4 and 5 in the Dragon’s Breath series. 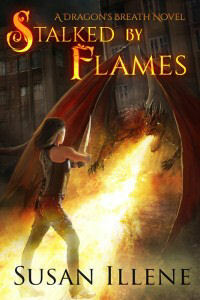 Can’t wait for CAPTURED IN FLAMES (Dragon’s Breath, book 5). So glad it wont be long , the story is brilliant and have read them all twice over. Is there a release date yet for Captured In Flames? Is there an updated release date for Captured In Flames? It’s still showing “late 2018” as the release.